You are here: Home » MEDIA » Books » Ruin And Rising (The Grisha Trilogy Book 3) by Leigh Bardugo (book/audio review). 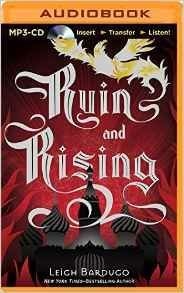 Ruin And Rising (The Grisha Trilogy Book 3) by Leigh Bardugo (book/audio review). Are you ready for the final instalment of The Grisha Trilogy? Following on from the previous book, ‘Siege And Storm’, the Apparat has Alina and Mal trapped below ground. Alina is unwell and she can’t summon any light. Meanwhile, the Darkling has taken the throne of Ravka and is searching for her. No one knows for sure what’s happened to Nicholai, but there are rumours. Can Alina and her friends escape? Can they find Nicholai? Can they find the firebird and can they save Ravka? The country of Ravka welcomes us again for further adventures with Alina, Mal and the Grisha. Ravka as ever, is still a fantastic setting for this ever more engaging tale. Alina remains an engaging lead. She keeps her good blend of character throughout. She has a great deal more internal conflict this time, much of which actually gets resolved, with this being the big finale. I was a little ambivalent about Mal in ‘Siege And Storm’, however he definitely redeems himself in ‘Ruin And Rising’. Likewise, Genya redeems herself for all her past crimes and is very much team Alina and there may just be a little something between her and David. We actually get some answers about Morozova, but I have to admit they’re not what I was expecting, though I don’t really know what I expected, just not quite what we got. The Darkling again is developed intriguingly. Much of the Darkling’s few good traits are uncovered in this book, making him slightly human, which is a little unnerving. We gain more insight in to the Apparat, but my overall feeling on him is that he’s more irritating than anything else. Overall, the trilogy comes to an end in a quite surprising way. It’s not a horrible ending. On the contrary, I think it’s one that fans will be quite impressed with. I certainly was anyway but, if you had asked me to predict, I would have come up with an array of other suggestions vastly different from what actually happens. ‘Ruin And Rising’ is no exception in that it is brimming with plot twists. Again, being the last book in a series where I’ve kind of explored all my feelings about the characters and being so plot twisty, there’s nothing more I can really say without being spoilery. What I will say, though, is that I think it’s my favourite in the trilogy and as much as I’m sad to have no more books with Alina, we let her go in a way that is pretty special. So please, go read this, it’s amazing. « Awesome science fiction and fantasy round-up (Offworld Report: Friday 1st July 2016).